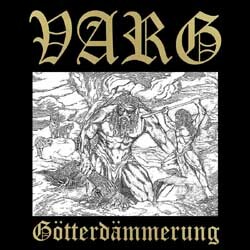 German wolf metallers Varg from Coburg have just released their brand new EP “Götterdämmerung” via Napalm Records in digipak edition CD. For over ten years, Varg have wielded the sceptre of German pagan metal, currently holding it tighter than ever in their bloody claws. The Wolfskult remains hearty as well, with thousands of devotees following the call of the wild and making the pilgrimage year after year to the band’s Wolfszeit Festival. Varg’s fifth epos “Das Ende Aller Lügen” touched down in the Top-20 of the German album charts. It’s clear that they are stronger than ever, but the band will not rest on their laurels. No, they’ve given their new “Götterdämmerung” EP their all; rapid flaring melodic death metal-riffs, heart-shaking singalongs and brutal lyrics that breathe fire and brimstone. “I am fire, Lord of the flame, I gorge steel and iron!” This is your party-playlist for doom’s day. Let nature take over and find yourself alone in the woods, torn apart by hungry wolves as lunatic Pagan hymns like “Hel” rise from the undergrowth. “We will never rest!” Varg promises. We pray they don’t!